I have heard a number of theories over the years as to why Gouldians seem to have a longer than usual maturation process when it comes to their parenting skills. I'm not really sure that they do. There are a number of finch species that won't parent raise their young, or else abandon their babies when they themselves are 'youngsters'. Only if you start comparing them to the Zebra or Society Finch do they appear to be "BAD" parents. To anyone that has ever owned a pair of Zebra finches, I'm sure it seemed that they bred like 'rabbits'. But even the Zebra finch has the bad habit of building a nest, laying eggs, and then building another nest immediately on top of the first. This sometimes goes on until the nest box or basket is overflowing with layers of nests. 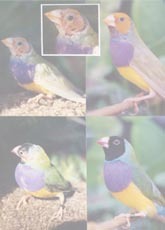 It is also believed that the social and nurturing nature of the Society Finch was initially improved so that they could be used as a 'foster parent' to other finch species, such as the Gouldian. I have been told that the pitching of newly hatched babies happens because the parents are startled when the eggs hatch, and they don't know how else to rid their peaceful, quite nest of the intrusion. Also if they are disturbed frequently by family activities, the pet cat, insects in the nest box, other birds such as the busy-body Zebra finch checking out their nest, etc. they may just decide to give up on that particular clutch of eggs. I believe that the closer that you can replicate their natural environment by housing and solitude, the more successful they will be at raising their young. Poor diet is also believed to be a cause of abandoned eggs. Raising progeny is very hard work on any bird, but unhealthy and nutrient deficient parents seem to know that they will not succeed. 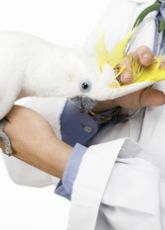 Starting several months before the breeding season begins, you should do everything possible to insure that your birds have "what it takes" to successfully raise their youngsters. You will find my recommendations on breeding startup and diet elsewhere on this web site. The Gouldian finch can be a very loving and nurturing parent once they have reached the maturity level for this particular instinct to "kick in" so to speak. Sometimes one may be pleasantly surprised to have this happen with the very first clutch that the pair produces. 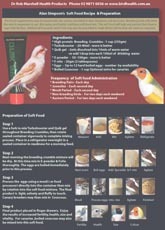 I have had many e-mails and calls from people telling me that this is exactly what has happened with their birds. I believe that it is more likely that a pair of Lady Gouldian Finches will parent raise successfully when they are housed separately with as little noise and excitement as possible. Without the distraction of other birds, they seem to devote their time and energies to their offspring more readily. All this being said, I have found over the years that I have been breeding Gouldian Finches that, in my facility, they CANNOT be reliably trusted to be nurturing parents until the are AT LEAST two years of age. Sometimes they will need to be even older, and frequently they can never be trusted to care for their offspring. But you must remember that there is a lot of activity on a daily basis in my aviary and thus the distraction that I spoke of before. One thing that I have always done is leave a radio turned on in the aviary except during the dark hours. I find that my birds are less excitable and stressed whenever a stranger comes into the bird room. I have had many people comment on that very thing when visiting my aviary. 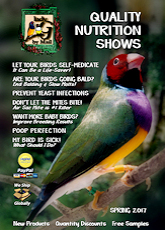 I'm not sure that I would recommend it for the pet owner with only a pair or two of finches as their birds would not be exposed to nearly as much distraction as one would find in a typical breeding aviary. I usually will not set up pairs that are under the age of two years, unless they are really a terrific looking pair. But in the latter case I am always prepared with foster Society Finches for the process of rearing the young. I would prefer not to use the Societies for fostering Gouldians, but it is the only way to acquire progeny from really special pairings before they have reached the maturity level to parent raise their own youngsters. Fostering with Societies also allows the responsible breeder to improve the quality of their strains far more quickly than relying purely on parent raising. The increased number of offspring produced through responsible fostering allows the winnowing process used to eliminate faults from a strain to progress much faster. If by chance, any pair of Gouldians, young or old, decides that they are going to incubate their own eggs, I keep a close eye on them throughout the incubation period. It is not unusual that they will incubate a week, or even only a few days, before abandoning the eggs. Once incubation is started, there is only a very short window before the embryos will be lost. Therefore my careful observation will allow me to transfer those eggs under Societies if abandonment happens. If the Gouldian parents do indeed incubate the eggs for the entire 15-day cycle, I am like a hawk on the day before and the day that I expect the hatching to occur. When the first baby is thrown from the nest, I immediately remove any other babies and any unhatched eggs, and place them with foster parents. Society Finches will most readily accept a live baby as their own as long as they are already in the breeding mode. I never give the Gouldian parents a second chance with this clutch or any other clutch they may lay during this breeding season. Next year I will let them try again. If you replace the thrown baby back into the nest, it will just be pitched again, with possible permanent injury to the baby. The injury will occur because the parent has to pick up the hatchling by some body part, and that usually is a leg or wing. Believe me, you don't want that to happen, as it will cripple the bird for life if it survives at all. If you do notice any blood on the first pitched baby, pay special attention to the Society nest box to which the clutch is transferred. If the baby dies, you will want to remove it from the nest, so that the other hatchlings are not contaminated by the decomposing body. Both Gouldians and Societies will remain sitting on the hatchlings for the first ten days. They might try to peck you (to me, this is the sign of a very dedicated set of parents) when you inspect the nest, but a gentle nudge with your finger will get them to come off long enough for your inspection. Societies in particular are wonderful parents and will immediately return to their brood. I try to disturb new Gouldian parents as little as possible. Some breeders believe that because quite a few Gouldians are fostered to Society Finches, they don't learn the behavior of parenting. I simply don't agree. A Gouldian nestling has no idea it is being raised by a Society Finch. All he knows is that he is being fed and kept warm. "Parenting by a Bird is Parenting by a Bird". Unless the baby is hand fed by a human, it should learn the skills necessary to raise it's own young. Eventually most Gouldians will exhibit the proper parenting skills. 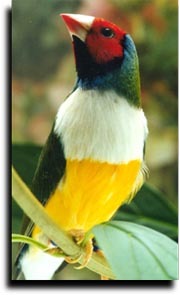 Some of my BEST Gouldian parents were all fostered by Societies. If all or even most Gouldians that were fostered by Societies NEVER raised their own offspring, then I might look at fostering differently. In a lot of instances, it does take the Gouldian longer than the Society finch to begin exhibiting reliable parenting skills but eventually it does so, and then there is no better parent around. 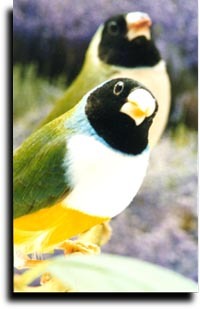 There is one consideration about fostering Gouldians to Society, or any Other finch species. If the Society fosters and the Gouldian juveniles are housed, be sure that you don�t leave them too long with their foster parents after they are independent and eating on their own. If they are housed in a colony flight, they will interact with many other than their foster parents as soon as they exit the nest. I believe that if they do stay longer than necessary in an isolated situation, there may be imprinting on the Society parents. They may in the future reject their own kind. My recommendation is that when purchasing Gouldians you want to do so when they are young. This means while they are at least still showing some of their juvenile feathers. I will not sell my juveniles before they are 6 months old. Most are still a little "green" at this age. My reason for getting young birds, is so that you have the assurance of just that, young birds. Once they are fully colored out, you could be hard pressed to tell their age. This being said though, you will have to be patient for them to become parents. I never allow my birds to breed before one year of age, but as stated before, two years is better. If you just can't wait, try as hard as you can to provide the best possible diet and a quiet housing situation. Be sure that you are prepared for the possible outcome, or else make sure that you have fosters available. I have found that if you just don't provide a nesting box or basket, the Gouldians won't breed because it is within the privacy of their nest that the breeding occurs. I'm sure that you will notice the courtship behavior, and possibly even some eggs layed on the bottom of the cage, but you won't have to be upset by the "tossing baby syndrome". Whatever you decide to do about breeding your Gouldians, don�t be afraid of owning them. They are hardy, terrific little companions that will give you and your family many hours of enjoyment. And one day soon they will be ready to present you with a clutch of their own little ones.